Do you want a Happy End? This is the latest version of the ZDNet award winner and 'BEST' Nonags winner program Happy End. 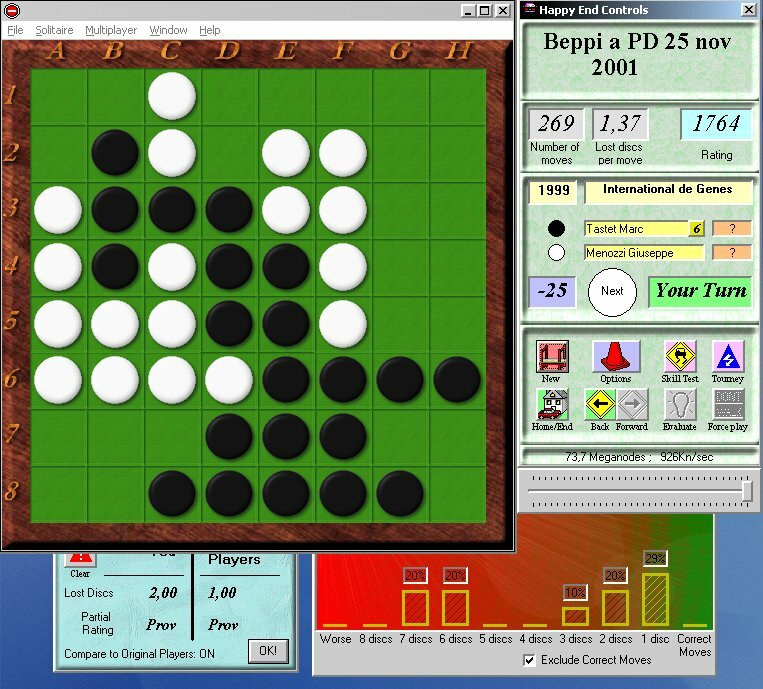 It allows you to play thousands of Reversi (Othello) problems, extracted from real world-class matches. It gives you statistics about your errors, the option to analyze the you endgames, and the option to play tournaments that are scored over the Internet. This is the best tool for those who want to become Reversi champions as well as those who just like to relax with a complex puzzle from a superb mind game. Happy End was created by Beppi Menozzi a couple of years ago; it quickly became very popular among Othello players. Happy End III includes the Zebra endgame engine by Gunnar Andersson, making it many times faster than the previous version. This makes it possible for you to try more complex positions than before. Happy End III Small.EXE 2.4MB January 23, 2002 Minimal installation. HE3.EXE 6.6MB January 23, 2002 Full installation. The difference between the two configurations is that the minimal installation only contains the most recent Thor databases, fewer graphics sets, and fewer support files. If the minimal installation doesn't work, try the full installation. Happy End III contains a skill test where you can compare your endgame solving skills to those of other players. The objective is to drop as few discs as possible in a randomly chosen set of 50 positions; the current ranking is found here.